Hopefully you rode with use last weekend, as we had the Ultra Music Festival live-stream going all weekend. We&apos;ve got one more weekend, and we&apos;re doing the damn thing again! The countdown is currently going, and should lead up to the 4PM start... although based on the schedules below, they don&apos;t have acts scheduled to perform until 5PM. Whatever the case may be, we&apos;ve got you covered on the live-stream tip. As we reported last night, Avicii&apos;s set will be streamed at 9PM, and he&apos;s planning on premiering his album during his time. Tonight&apos;s line-up also features Tiesto, Boys Noize (on the live stage! ), Eric Prydz, Martin Solveig, Adam Beyer, and plenty more! 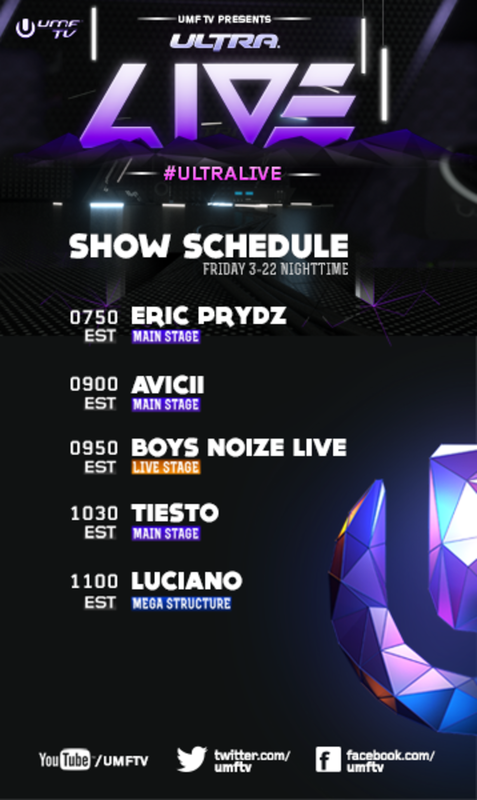 Full schedule is down bottom, and you know we&apos;ve still got the complete list of set-times for the 2013 Ultra Music Festival for the party people who are down at Ultra right now!